Will the Dying Industry Continue to Beg for More Government Subsidies? AlterNet 2010 again left the "nuclear renaissance" in the Dark Age that defines the technology. But an Armageddon-style battle looms when Congress returns next year. The atomic energy industry has suffered another astonishing defeat. Because of it, 2010 again left the "nuclear renaissance" in the Dark Age that defines the technology. But an Armageddon-style battle looms when Congress returns next year. The push to build new nuclear plants depends now, as always, on federal subsidies. Fifty-three years after the first commercial reactor opened at Shippingport, Pennsylvania, no private funders will step forward to pay for a "new generation" of nukes. So the industry remains mired in unsolved waste problems, disturbing vulnerability to terror and error, uninsured liability in case of a major catastrophe, and unapproved new design proposals. Two new reactor construction projects in Europe -- one in Finland and the other at Flamanville, France -- are sinking in gargantuan cost overruns and multi-year delays. To financiers and energy experts worldwide, it's a clear indicator the "rebirth" of this failed technology is a hopeless quagmire. Meanwhile the 104 reactors currently licensed in the US are leaking radiation and are under escalating grassroots attack. Vermont's new governor, Peter Shumlin, is committed to shutting the Yankee plant there, and public demands to close New York's Indian Point and Oyster Creek, New Jersey, among others, have reached fever pitch. Most importantly, advances in green technologies are leaving atomic power in the dust. Numerous new studies now show it is significantly cheaper to build new generating capacity with photovoltaics, wind and other renewable Solartopian sources than to go nuclear ( http://nukefree.org/energy-information-administration-nuke-costs-rise-while-solar-falls ). That gap will only grow in the coming years. But Barack Obama proposed some $36 billion in new nuke loan guarantees to add to $18.5 billion set aside by the Bush Administration. Earlier this year he handed $8.33 billion of that to a Georgia utility that broke ground on two new nukes at the Vogtle site, where two old, trouble-plagued reactors still operate. 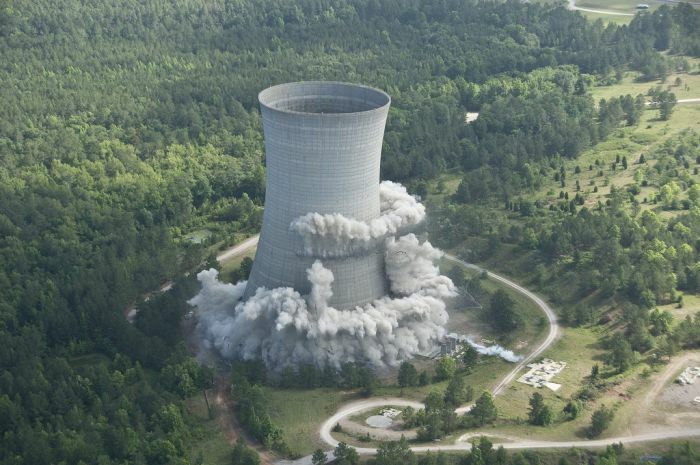 The nukes are being built in Georgia -- along with two more in South Carolina -- because ratepayers are being forced to foot the bill as construction proceeds. The company's returns are guaranteed even if the reactors never operate. Georgia has already suffered crippling rate hikes of $1 billion and more to pay for a construction project likely to wind up as little more than a moribund mausoleum. Nonetheless, amidst a major economic crisis, the White House and its pro-nuke allies have been pushing hard to fund still more of these radioactive boondoggles. As Congress wound down this fall, the Administration inserted $7 billion in new loan guarantees into the first Continuing Resolution meant to fund the government on an interim basis. That CR was abandoned for a larger Ominbus Budget proposal, into which $8 billion for new nukes was stuck. But grassroots activists from around the nation flooded Congress and White House with at least 15,000 calls and letters. Amidst the chaos of the lame duck session, the Omnibus bill fell by the wayside. Yet another CR emerged, this one stripped of earmarks -- including all money for new nuke guarantees. Thus the industry was once again shut out. In the past decade it has spent more than $640 million lobbying for federal handouts. But a vastly underfunded grassroots movement has held its own. In 2007 the industry tried to gouge out $50 billion in new guarantees, but was beaten back by a national campaign (www.nukefree.org) that continues to rage. The industry will surely return with its money guns blazing. A far more conservative Congress will convene in January, and the industry will pour its usual unlimited steam of lucre into legislative coffers. The "renaissance" is nothing if not a cash cow for Congressional candidates and the White House.